Sometimes, kids just don’t see the need for prewriting. Why fill out a graphic organizer if you are just going to copy it over into paragraphs anyway? 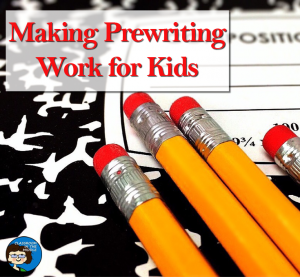 Teaching kids how to prewrite isn’t hard, but teaching them that prewriting really is a useful process can be a tall order. 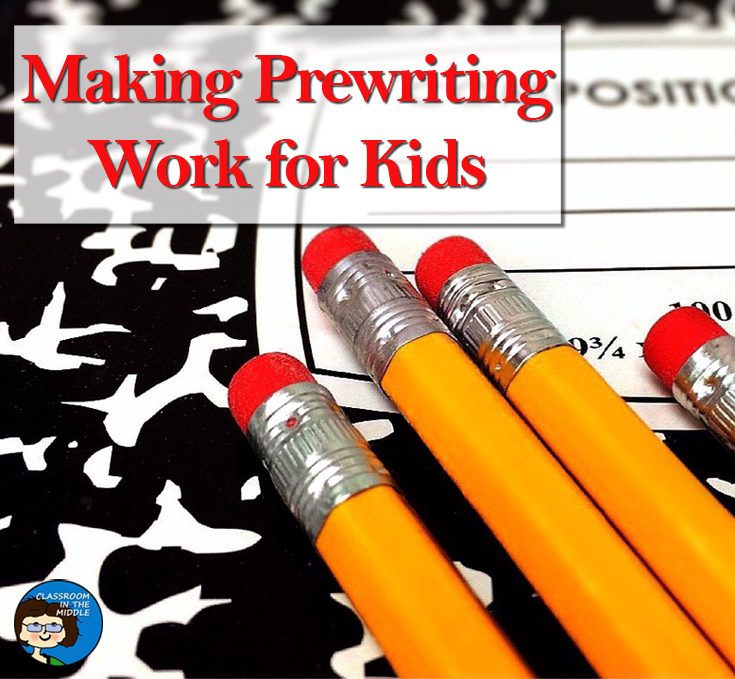 Two activities that I like for showing kids what prewriting is really all about are prewriting without writing and prewriting from a finished piece of writing. 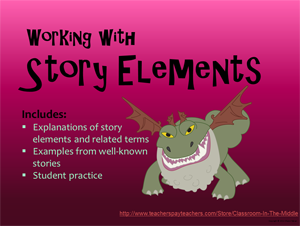 Kids don’t need to complete all of the steps of the writing process all of the time. 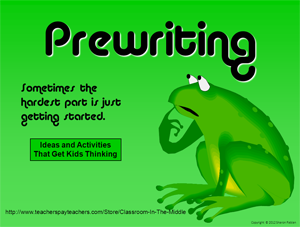 If they just need to learn about prewriting at the moment, prewritings can be done quickly on a number of topics for practice. In this case, the prewriting itself is the finished product which kids will need to complete well to turn in. Many graphic organizers can be used for prewriting. Some that I like are a web, a timeline or plot diagram, and an information chart. 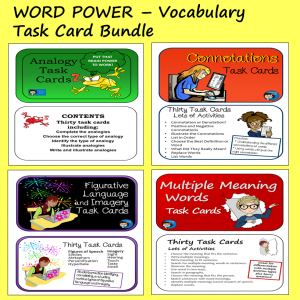 Each of these is easy to expand according to the needs of the students. 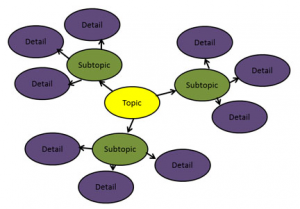 To expand on a web, which is a great basic organizer for descriptive writing, have students write their topic in the center and then add a second round of bubbles with subtopics before moving on to the outer bubbles in which they write their details. To expand on a simple timeline, which is a useful organizer for narrative writing, have students turn it into a plot diagram by deciding which parts of their story are the rising action, the climax, and the falling action. With the plot diagram, they will see that they need to include some introductory material, usually called exposition on a plot diagram, and a good ending, called the resolution. Information charts can easily be modified in the same way as the web by adding more layers of subtopics and details. 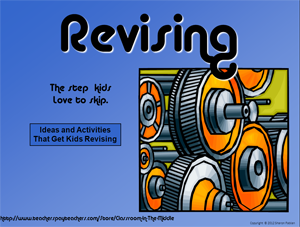 Occasionally it can be helpful to use prewriting in reverse – have kids complete a “prewriting” graphic organizer for a story or article that they have read in class. 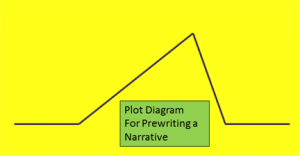 A plot diagram works well for any narrative writing – fiction or non-fiction. A web or some type of information chart works well for informational text. In this case, when students fill out the organizer, they will basically be summarizing the story or article. Then when they are finished, you can point out that their organizers might be something like what the author did before writing the piece. 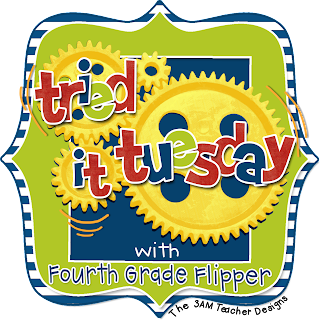 Follow up this activity with students doing a real prewriting of their own. 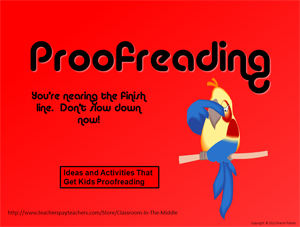 Here is a link to my Prewriting PowerPoint which can be useful for introducing the whole idea of making prewriting really useful. 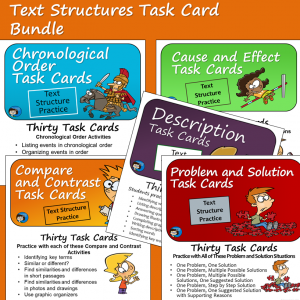 And here are some more of my writing resources from my Teachers Pay Teachers Store. You are correct that teaching prewriting can be a tall order! 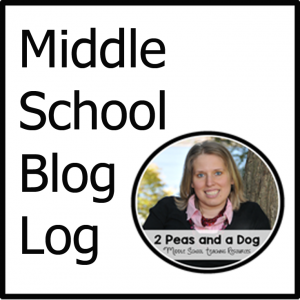 I love the idea of teaching prewriting in reverse. Your product looks awesome. Thanks so much for linking up!